Although I wrote everything I know about squirrel issues for this website, oftentimes a problem with squirrels in the attic is beyond the scope of the do-it-yourself homeowner to solve. I have found a professional company in Jackson, Mississippi that handles problems with wildlife. 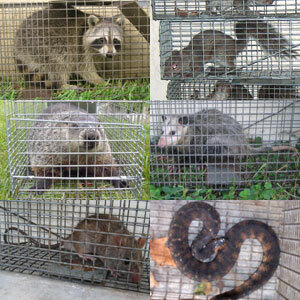 Critter Capture, LLC has access to tools, techniques, and experience that help them do a far better job at wildlife removal than a non-experienced homeowner could. They possess licensing that allows them to do certain types of work legally, that non-licensed homeowners in the state of Mississippi are not allowed to do. For the welfare of your situation, and the squirrels, in some cases it's best to hire a pro. There are good companies and bad companies out there. I've done research on such companies, to get to know them, and feel confident recommending their services. I therefore recommend a company called Critter Capture, LLC which services Jackson, Mississippi. If you have a squirrel problem, or any other conflict with a wild animal, and live in Jackson, I am confident that this company, Critter Capture, LLC, is the one to call. I asked the company to describe their service range, and they said this - Our service range includes downtown Jackson, and surrounding areas like Clinton, Ridgeland, Madison, Flowood, Brandon, Richland, and more. Critter Capture, LLC operates 24/7, so don't hesitate to call at any time to discuss your wildlife problem, and schedule an appointment for same-day or next-day service. Evictor lights do not work, in my testing and experience talking to hundreds of people with squirrels. We live in the suburbs and believe we may have an issue with a squirrel that is setting up a new home in our attic. What would be the approximate charge for your company to investigate, trap and remove the critter? Hello I seem to have an occupant in the ceiling of my basement my brother stays down there and recently heard scratching. I believe it's a squirrel that has gotten trapped somehow came through chimney or roof or fell in during storm. Never had this problem before what do I do I live in Chicago. Do not want to cut a hole in ceiling and this rabid squirrel comes out. Please help. Hi David, I'm a single mom trying to figure out what to do about the squirrels that I hear intermittently in my attic. I think that I could possibly follow your tips and do what needs to be done on my own. But, if I do seek out professional help, about how much should I expect to pay? If you have a squirrel problem in Hinds County Mississippi, or any other conflict with a wild animal, I am confident that we can solve it. We use humane methods when dealing with Jackson wildlife removal situations. Squirrel Control Jackson. Our company is fully licensed and insured in Mississippi. Call us any time at 601-255-0830 for a price quote and to schedule a same-day or next-day appointment to solve your squirrel problem in Jackson.